(born in 1962) – writer, essayist, screenwriter, poet, psychologist. Author of novels, including Podróż ludzi Księgi (1993), E. E. (1995), Prawiek i inne czasy (1996), Dom dzienny, dom nocny (1998), Ostatnie historie (2004), Anna In w grobowcach świata (2006), Bieguni (2007), Prowadź swój pług przez kości umarłych (2009), Księgi Jakubowe (2014), zbiorów opowiadań Szafa (1998), Gra na wielu bębenkach (2001), Opowiadania bizarne (2018), as well as Lalka i perła (2000) essay, devoted to Bolesław Prus’ Lalka, a collection of articles titled Moment niedźwiedzia (2012) and children’s book Zgubiona dusza (2018). 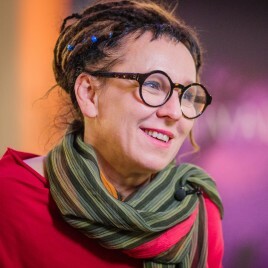 Winner of many awards, including the Kościelski Foundation Award (1997), Paszport Polityki Award (1997), the Silesian Cultural Award (2003), the Samuel Bogumił Linde Prize of Partner Cities Toruń and Göttingen (2003), the Uznam Literary Award (2012), the Slovenian Central European Literary Award (Vilenica, 2013) and the International Bridge Prize (Brückepreis) Europa – City of Zgorzelec/Görlitz (2015). She has been nominated five times for the Nike Literary Award, which she received twice: in 2008 for her novel Bieguni / Flights, and in 2015 for Księgi Jakubowe / The Books of Jacob. She received the prestigious Brücke Berlin-Preis (2002) for her Dom dzienny, dom nocny novel and was also nominated for the International IMPAC Dublin Literary Award (2004). She received a distinction of the Bologna Ragazzi Award (2018) for Zagubiona dusza (together with Joanna Concejo). Her books have been translated into many languages including English, French, German, Italian, Spanish, Swedish, Danish, Bulgarian, Serbian, Croatian, Russian, Czech, Ukrainian, Turkish, Chinese, Japanese and Hindi. Some of the works have been adapted for the stage (including Prawiek i inne czasy, twice directed by S. Majewski and P. Tomaszuk, E.E., a performance of the Television Theatre, directed by Maria Zmarz-Koczanowicz, The Books of Jacob were also adapted as a play by the Powszechny Theatre in Warsaw, directed by Ewelina Marciniak), as well as film adaptations (Żurek, directed by R. Brylski, Ariadna na Naksos/Aria Diva, directed by A. Smoczyńska). In 2016, based on the writer’s script based on Drive Your Plough Over the Bones of the Dead, Agnieszka Holland directed Spoor, which won the Silver Bear Award at the Berlin Film Festival in 2017. In 2018, an English translation of Bieguni (Flights, translated by Jennifer Croft) was published and received the Man Booker International Prize.